There are seven billion people on the planet and more than one-quarter of them suffer from malnutrition, mostly in South Asia and sub-Saharan Africa. By 2050, the global population is expected to reach 9 billion people and the number of under-nourished children to increase by 25 million. We are now facing one of the biggest challenges of this century – how can we feed all these mouths? Innovative solutions need to be implemented and technology and information sharing can help produce enough food and correctly distribute it around the planet. The African continent has huge potential with 60% of world’s non-cultivated arable lands but still spends $25 billion annually on food imports. Africa could play a major role and take on future food challenges, yet it needs to leapfrog the innovation gap with other continents to produce enough food for its own population and work toward becoming a food exporter. Even though African farmers are attached to their traditions and quite reluctant to change, they are not immune to the technology revolution. Just like in the banking industry, where mobile money technologies have become pervasive regardless of the quasi-inexistent banking system, agriculture must follow suit. 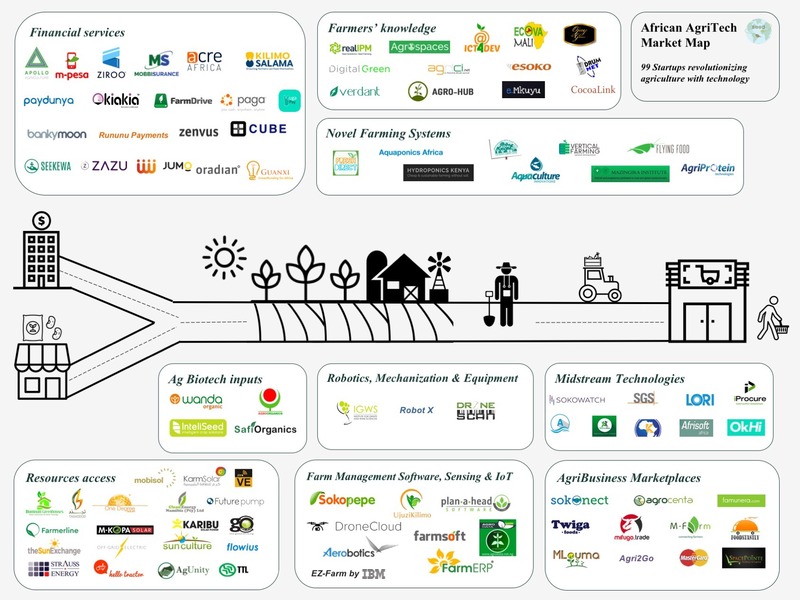 How do we get our products in this overview, with the largest integrated network of grouped farmers in east africa, and tools for finance, electronic marketplaces, on line buying, plot registration, best practices, crop calendars, incident reporting, and our development for agri advice and weatherforecast, product selector, digital agri coach, seed selector, etc. we would like to know how we could connect. 1. You cannot talk of smallholder irrigation in Africa without mentioning KickStart’s ‘MoneyMaker’ human powered pressure pumps. Over 300,000 MoneyMakers have been sold to farmers in East, Southern and West Africa. Thats a big number. And tens of thousands of ‘knock-off’ copies of MoneyMakers are also out there – some not so good, some really bad. 2. Wanda Organic is not a start up any more. Bio-organic soil and plant health products(fertilizers and sprays) are made available to tens of thousands of smallholders in Kenya via a USSD platform run by Wanda Mobile. Farmers access markets for their products via Wanda Soko. 3. Is M Farm still functioning? Their website shows latest post 22 July 2016. Please send me this List of these 99 companies with Country of Incorporation. Which companies are already introducing it into production?